Though our past hikes on the Milford Track (New Zealand), Inca Trail (Machu Picchu), Glacier (U.S.), and various areas of Switzerland and Austria were particularly memorable, we must confess that the hiking, horseback riding, and spectacular setting of, relatively inaccessible, Patagonia is unparalleled. The critical contrast is Patagonia’s pristine remoteness: no mass tourism or crowded hiking trails here! When hiking a wide range of areas on the Patagonian Andes, it is easy to see how Torres del Paine still has hundreds of unnamed mountains, with many points inaccessible and unexplored. Located at the tip of the South American continent, the outstanding national parks and private reserves stretch 1,242 miles across the Andean wilderness. The features of Patagonia are remarkable: wild rivers, muddy rainforests, glaciated peaks, granted monoliths, and vast steppes. This is a place for reflection, deep solitude, and unforgettable outdoor activities. Upon arrival in Santiago, you will be privately transferred to the Singular Santiago. With the Bohemian Castaria neighborhood as your base, you may opt to take a half-day tour of Santiago’s fun central district. This morning you will travel to Torres del Paine, a UNESCO Biosphere Reserve containing a complex intertwining of ecosystems. Upon arrival, you will be checked-in to Explora Patagonia. You may read more about remarkable Patagonia here. Depending on your physical fitness level and general interests, Explora offers a wide variety of hiking and horseback options, ranging from beginner to experienced, in a number of astounding environments. While on my Patagonia scouting trip, I viewed two pumas in one afternoon hike! You will be privately transferred to the quaint village of El Calafate, set in a remote Patagonia landscape, and check-in to Eolo Patagonia. You will have a chance to explore the Perito Moreno Glacier. The centerpiece of Los Glaciares National Park, the Perito Moreno measures 18 miles long, three miles wide, and nearly 200 feet high (approximately 20 stories!). Home to Mount Fitz Roy, Cerro Torre, Viedma Glacier, and Lago Del Desierto, this full-day excursion is worth the beauty that El Chaltén has to offer. Over the next two days, you will tour southern Buenos Aires, visiting Plaza de Mayo, Metropolitan Cathedral, and Casa Rosada (Presidential Palace). Continue to the colorful barrio of La Boca, originally settled by Italians from Genoa. You may take a visit to open-air markets like San Telmo and Plaza Dorrego which offer crafts, antique shops, and tango events. You have the chance to take a hydrofoil through the River Plate until Colonia de Sacramento (Uruguay), a UNESCO World Heritage Site. The extraordinary Explora Patagonia is our favorite luxury lodge in the entire 1,242 foot stretch of the Patagonia Andes. The 49-room Explora Patagonia, Chile is located in the very heart of Patagonia, in the unspoiled Torres del Paine National Park, sitting on the shores of Lake Pehoe. This lodge is the quintessential base for exploring the montage of ecosystems in Torres del Paine National Park, designated as a UNESCO Biosphere Reserve! Despite its remote location, Explora Patagonia provides all essential luxuries in a comfortable, understated way that reflects Patagonia’s natural environment. The sleek, linga-wood designed rooms seem large when looking out at the splendid views. A deciduous, mountain tree, the Patagonia linga is now fully preserved in its unique South American environment. Though it is perhaps not as architecturally striking as the Singular, the Explora more than makes up for it with one of the most spectacularly picturesque settings of any lodge we have stayed at in the world! Explora’s luxurious amenities include open-air hot-tubs with the Paine River insight, a heated pool, spa, sauna, Chilean bar, and its own horse stable. With the area’s highest quality guides, wonderful food selections, and many hiking and horseback riding options, this place is certainly worthy of a four-night stay. Of special note, Explora is the only lodge in Patagonia with its own bred and trained stable of 26 horses (including Arabian!). All horses have been raised on the Ibanez Estate, not far from the Explora property. Eolo is a country lodge, comfortable and spacious, and somewhat similar to ancient Patagonian “estancias”. The lodge is a compound of 17 suites, all with panoramic views. Similar to the Explora Patagonia, Eolo offers a wonderful natural setting with no sacrifice in comfort and outdoor activities, including hiking, biking, and horseback riding. One can observe Lago Argentino towards the north, La Anita Valley towards the east, and the Torres del Paine and the Rico branch of the same lake towards the south. A client staying here mentioned the lamb she had here was the best in South America! The Alvear Palace is widely considered the most luxurious 5-star hotel in all of Buenos Aires. 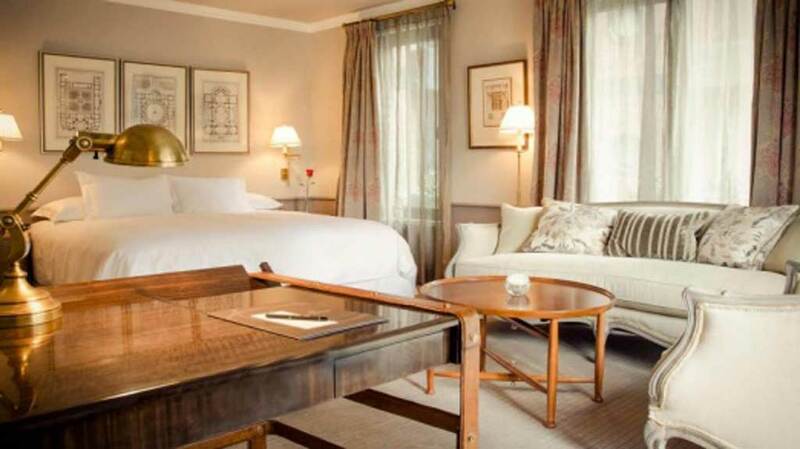 The 197 rooms are designed in Louis XV and Louis XVI styles, all with butler service. Most of the bathrooms here have LCD televisions and separate showers. The only amenity that the Four Seasons has on the Alvear is an outside pool. The Alvear is the iconic luxury hotel in Buenos Aires!